I enjoy doing a wide variety of hand crafts. Embroidery is one of them. I had an old stool that I wanted to fix up for our part-time condo living room. Here's what I did. After the wood was stripped, sanded, stained and finished with urethane, I started on the seat cover. I chose burlap for the backing because it's easy to count the threads to keep a pattern uniform. One disadvantage of burlap is that it wears through fairly quickly. If your stool is going to get lots of use, a firmer material would be better. I cut a piece of burlap large enough to cover my stool's top with enough extra to turn under during the upholstery process and a little extra in case the loosely woven material unraveled. You can always trim it to size later. I drew my border design on the burlap lightly with pencil. Working from the outside in, I first created the frame for my picture. I then drew my central picture on newspaper and transferred it to the burlap, again using light pencil marks. I chose my float cabin and garden for my design. 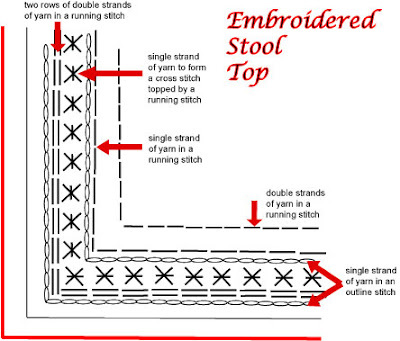 If you are looking for a good resource on embroidery, go to Sharon b's Dictionary of Stitches for Hand Embroidery and Needlework. It's has both photographs and descriptions of numerous stitches. Here's the pattern I used for my border. You can use it and then customize the central picture to match your life and interests, or just keep working in geometric shapes. Don't have a stool? The same method can be used for pillow covers. Fortunately, the stool's padded plywood seat was still in useable condition. 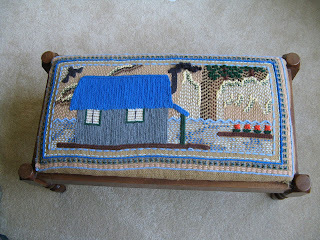 When the cover was done, I used upholstery tacks to secure it to the plywood bottom. So, if you are looking for a simple way to create a unique focal point in your home, try yarn embroidery on burlap. From Bellingham, take Chuckanut Drive to Edison for a scenic excursion. 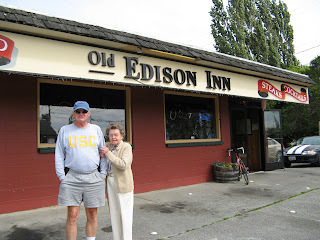 When you get there, stop at The Old Edison. This historic restaurant was established in 1934 and has provided good food and drink to locals and travelers alike. The Edison has two things I really love, beer and oysters. The restaurant has 15 beers on tap, now that's a little bit of heaven. You can get oysters as an appetizer or a meal. Of course, there are steaks, burgers, salads and other good stuff -- but the oysters are for me. Prices are very reasonable and the oldtime casual atmosphere makes it comfortable. Want to eat outdoors on a sunny day or warm evening, there's a huge grass area with tables out back. Like entertainment? There's a pool table and two huge shuffleboards. They have live music every weekend. Lunch is served daily from 11:30 a.m. Closing is at 11:00 p.m. Sunday through Thursday, later on Fridays and Saturdays. Wayne and I fly our Piper Arrow 997 along the West Coast several times a year. In summer, the cooler weather reduces turbulence. When the Oregon coast isn't covered in fog, our favourite stop is the Siletz Bay Airport (S45 ) at Gleneden Beach, Oregon. Even when we camp at the airport, we love to eat out. There are two excellent restaurants within walking distance. One is at the Salishan resort. 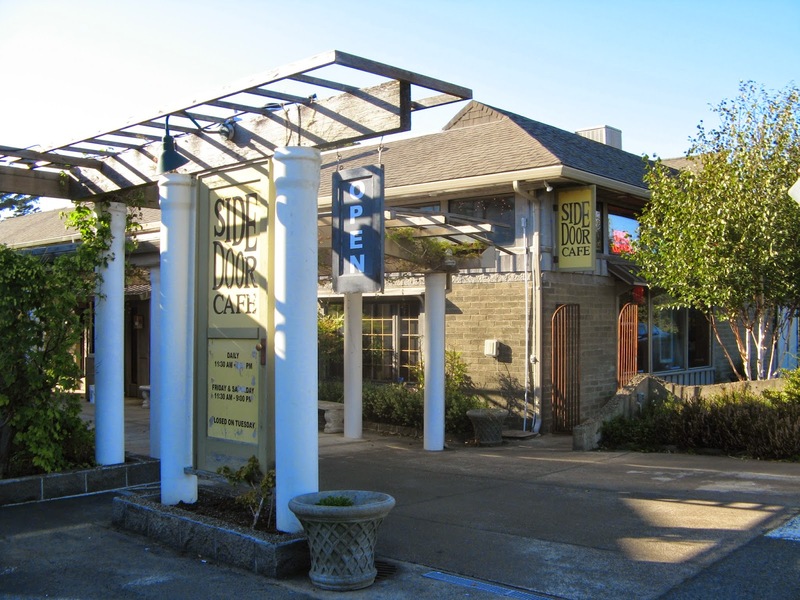 Our favorite, however, is the Side Door Café at Eden Hall. Take the airport access road and cross Highway 101 (carefully). You will find a partially hidden trail with steps leading to Gleneden Beach Loop Road. Turn left (south) and the restaurant is on the other side of the road. They are closed on Tuesdays and you may want to call before flying there for dinner during the winter months. There are many interesting things within walking distance of the airport. You can take the Gleneden Beach Loop and walk past beautiful beachfront homes. Just north of the Salishan Resort is Siletz Bay. It's a bird-watcher’s paradise. For easy walking access to the beach, take Highway 101 south to Wesler Street and head west to the Gleneden Beach State Recreation Site. If you fly or drive and prefer a hotel, the Salishan Spa and Golf Resort has excellent accommodations. The golf course and location make it a good travel destination any time of year. For fly-in guests, it's just a short walk north along Highway 101. Whether you are looking for dinner or an overnight destination, try Siletz Bay State Airport at Gleneden Beach. You can read more about our flying adventures at Siletz Bay and Gleneden Beach in two of Wayne's books. 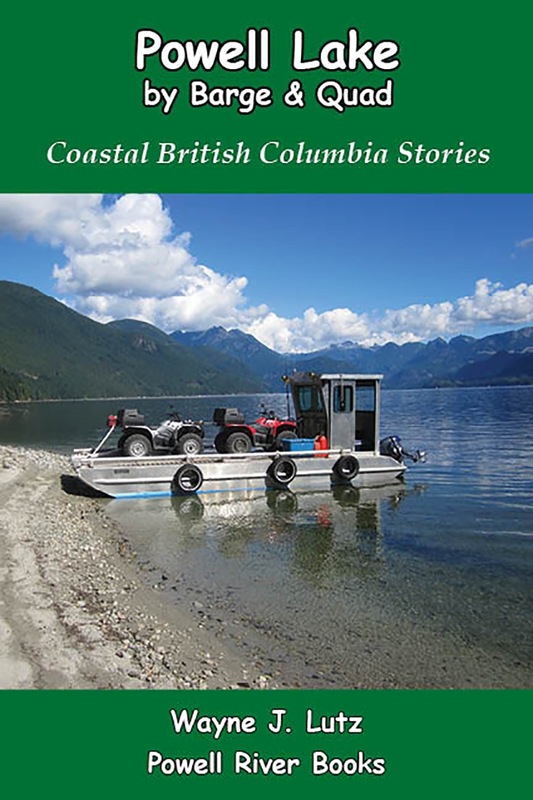 Up the Airway includes stories about flying along the West Coast and throughout Canada. Flying the Pacific Northwest features flying destinations in Oregon and Washing. Both books are written for pilots and non-pilots alike. 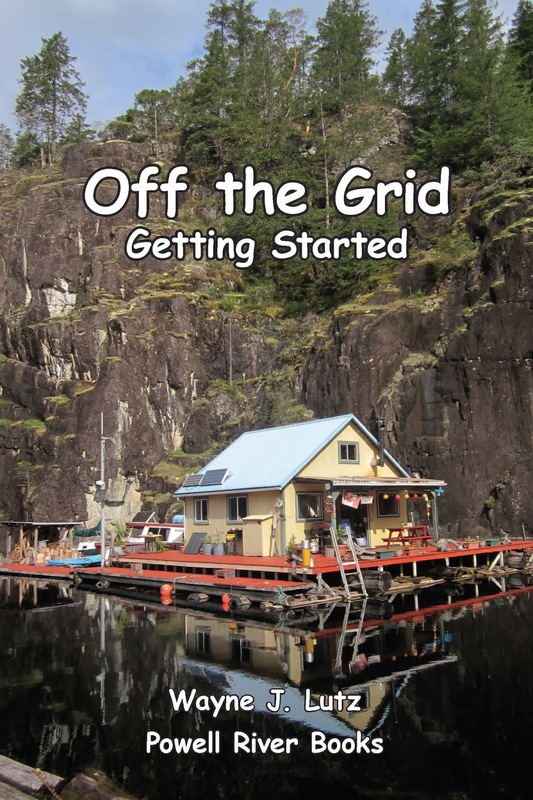 For more information go to www.PowellRiverBooks.com. For the last two and a half years of her life, I lived with Mom in Bellingham. That way she was able to stay in her own home, which was wonderful for her and me. I did most of the cooking, but Mom helped with some of her favourite recipes. 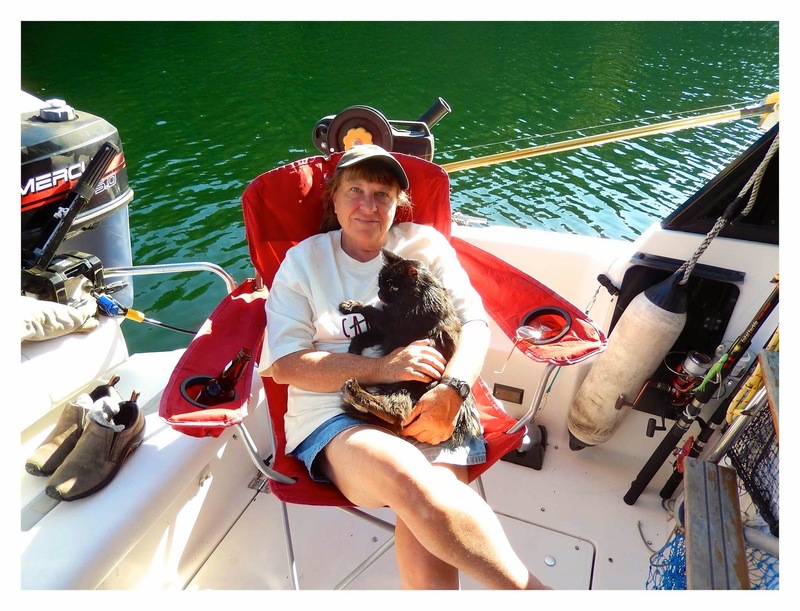 It gave her a chance to stay active, in her normal routine, and feel more independent. Mom's been gone over a year now, but every time I fix her favourite foods I remember all the wonderful things she did for me. That makes them real comfort foods. Mom liked to make a simple Lime Jello Salad that kept well in the refrigerator, and was a refreshing addition to her lunches and dinners. I especially liked it because it was quick and easy to prepare and serve. Dissolve jello in hot water in an 8X13 glass baking dish. Stir in the half can of crushed pineapple (freeze the rest for another batch). Let the jello cool while you prepare the other ingredients. Cut the grapes in half. Give the celery a fine chop. When the jello is cool, add the grapes and celery. Cut the apples into small pieces immediately before putting them in the jello and make sure they are coated with the mixture. This will prevent discolouration and help the salad last longer. Cover with plastic wrap. Pat it down to touch the surface of the jello. 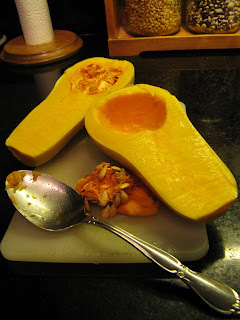 This will also help it to keep longer in the refrigerator, usually up to a week. If you are looking for a tasty salad to take to a holiday potluck, this one easily fits the bill. For a quick and easy side salad at supper, just shred some lettuce, place the jello on top, add a dollop of mayonnaise and shake a little paprika over the top. Yum! Do you have any favourite jello recipes? I'd love to hear about them. 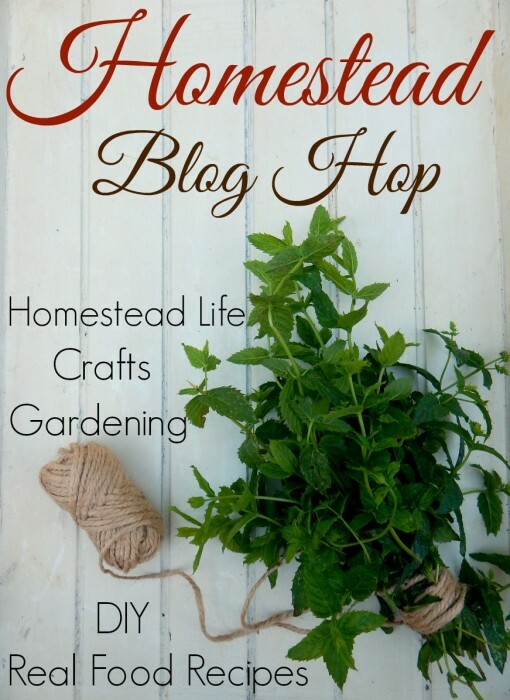 Hop on over to the Homestead Blog Hop at Idlewild Alaska and see some great ideas for homestead and simple living.